“We know that there are a lot of impressive carriers out there. To be considered one of the top trucking companies is truly an honor and something that Navajo is very prideful of,” says Don Digby Jr., president of Navajo Express. 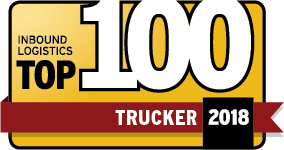 Denver based carrier, Navajo Express, has been selected by Inbound Logistics as a Top 100 Trucker for 2018. Inbound Logistics’ selection criteria includes aspects such as industry recognition, niche specializations, transportation services that meet shippers needs, industry presence, current clients and testimonials. The editorial staff for Inbound Logistics chose Navajo Express as an industry leader from a pool of 400+ candidates. This is the first time that Navajo Express has made the list, which will be featured in the September issue of Inbound Logistics. Along with the Top 100 Truckers list, Inbound Logistics will be updating their Trucking Decision Support Tool to reflect those who are new to the list. The tool is an efficient way for the Inbound Logistics audience to enter their trucking requirements and match to a carrier that best suits their needs. With more than 75 years of experience facilitating transportation solutions, Navajo Express’ services include dedicated fleets; intermodal; specialized equipment; and truckload services. Navajo Express delivers superior results to business partners through advanced shipping concepts and world-class customer service. For more information on their shipping services visit www.navajoexpress.com.